A simple question: What percentage of the United Kingdom and the United States’ electricity is used by houses? If you think it’s the majority, then you will be disappointed to find out that it is only 35% in the UK, and 36% in the US. The UK and US are in fact higher than most developed countries, Germany for example is down at 26%. Despite this electricity generation is very often framed purely in terms of residential electricity supply, completely ignoring the much more important non-industrial sectors. A particular example is media reports on new wind farms. The first phase of the London Array project, around 12 miles off the coasts of Kent and Essex in the Thames Estuary, will see 175 turbines generating enough power to supply more than 470,000 homes. Now, whether the news report is about a wind farm or a nuclear power plant the power generated is almost always put in terms of how many houses the wind farm or power plant can provide electricity for. Strangely street lighting, shops and industry aren’t thought to be worth mentioning. What we have here is a rather simple marketing trick on the behalf of the power company to make something appear to generate more electricity than it is, and it consistently gets regurgitated by journalists. 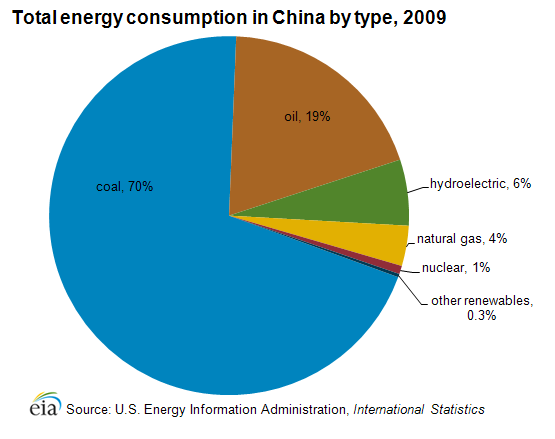 Wind energy has become China’s third-largest energy source, behind coal and hydropower. Only one third comes from electricity. Is this focus wrong? Based on the current consensus among UK environmentalists the UK should aim to fully decarbonise electricity by 2030, before other sectors are decarbonised. There are good arguments for and against this target. However the key argument here should be one from ignorance. There is a huge amount of uncertainty over the costs of reducing emissions in each sector, and this uncertainty implies that what we need is flexibility and pragmatism and not a very narrow focus on reducing electricity emissions. So, it is perhaps time for this blog to change its focus, or perhaps someone can convince me otherwise. Electricity has always been a focus in climate debates/policies for the reason that technology can actually do something about it. All other energy areas require radical changes of behaviour, or put more simply sacrifices we are not willing to make. There are no quick tech fixes. Well, that is except for electricity, which being bloody marvelous can at least partially substitute for some of the other energy use. So no, screw it, stick with the electricity focus Robert or else you’ll end up writing entries about why we should all be planting trees or not eating beef. Somehow I don’t think that suits your style. Another reason why electricity is always at the front is that one can hope to suppress fossil fuel use by using electricity instead, and there are reasons to believe it’s the main way forward. One has just to look at the hype surrounding electric vehicles. But to truly decarbonize, electricity itself has to be 0-carbon. Yet another reason is that climate issues were brought to the public arena by environmentalists (and still are). And they came with their own solutions, which where heavy in renewables energies like wind (ye, already in the 70s) which produce electricity. 1) There is a difference between electricity and energy. Addressing climate change will require a holistic approach to energy, not just decarbonizing electricity. 2) Most people don’t know how to conceptualize a KW compared to a KWh, and that makes it tough to make informed choices. 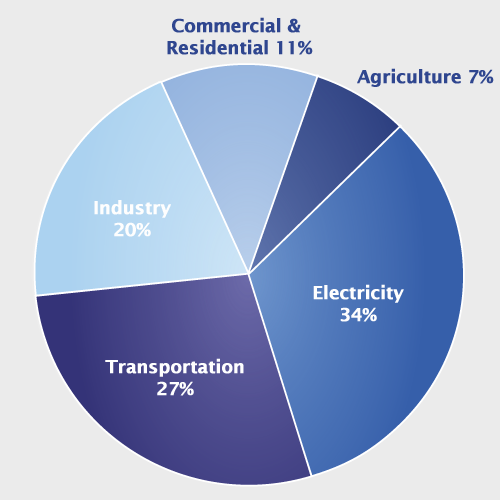 -In 2010, 85% of the energy consumed in the U.S. was produced by combustion of fossil fuels. -Energy is the primary source of GHG emissions, 87% of total emissions. -The U.S. combustion of fossil fuels accounted for 18% of global emissions in 2009. This is mainly electricity and transportation. Decarbonizing those sectors should really be a starting point for any conversation about addressing climate change. To the second point, I think it is more helpful to start explaining how energy resources are interrelated rather than list stats about them. While percentage of total supply is pretty useful as an overall indicator of single fuels, and I like percentage of peak vs. baseload to provide more clarity, I actually think that education about electricity should be about how energy sources interact. The stacked bar graphs that show what fuel is providing how much energy at a sub hourly level are really useful. Total installed capacity is a good story, but with renewables- using that as the sole metric doesn’t really do them any favors. I’d prefer to see more reporters talking about how solar offsets the need to use peaking natural gas in a particular place, etc. The exact percentages from land use are still an area if debate though.